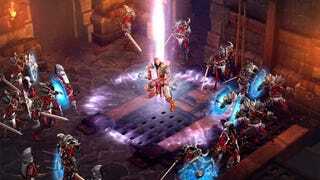 Not so long ago, Blizzard voiced interest in taking Diablo to other genres post-Diablo III—up to and including an MMO. That was the goal, said then-game-director Jay Wilson: to evolve the universe to be able to "support" an MMO. Now, however, times have changed, and so has Blizzard. So what's next for the series? More of what people have liked about Diablo since the beginning. Of course, it took Blizzard quite a while to get Diablo III to a point where people stopped declaring it The Devil Incarnate (in a not-good way), so you might think they're feeling a little... risk-averse. Martens, however, insisted that thanks to an expanded ability to publicly test and re-test new features, they're actually more open than ever to venturing outside the itsy bitsy loot box with Diablo III updates. For now that means new items, enemies, and areas, but Martens hinted that bigger things are on the horizon. But that can't be it. Genres demand more and more and more—evolution, innovation to fuel their infernal engines. Otherwise they starve into irrelevance. So if bigger is no longer better, what's the next step for Diablo-style action-RPGs in Martens' eyes? He said there's no need to speculate; it's already happening all around us. "I think people tend to take different components of the classic Diablo formula and combine them in new ways, as do we," he explained. "Like, what Destiny's trying to do with loot and replayability and a futuristic setting in a shooter environment. That's a really interesting way to do it. Going bigger is certainly one way to go, but there's also games like [indie roguelike platformer] Rogue Legacy, which emphasizes the randomness." "Even if we stay in the realm of action-RPGs with randomization, there's no shortage of things you can do with that. The future is bright. And I think not every game has to be like Diablo. After Diablo II there was a period where a bunch of games were a lot like it, but then people decided to try different things. And Diablo III came out of that environment in that it's both very similar and very different." So then, a Diablo MMO's off the table, but at least we're not at a lack for options. I feel like it'd be more of a bitter pill to swallow if Diablo III's auction house didn't fall in a ditch and die so unceremoniously. Diablo-inspired games like Path of Exile have more successfully integrated MMO elements into the formula, so there's that too. I'm curious, though: how many people still want Blizzard to make their other major series into MMOs? That was all people could talk about a couple years ago, but MMOs aren't exactly all the rage anymore. How do you feel about them?